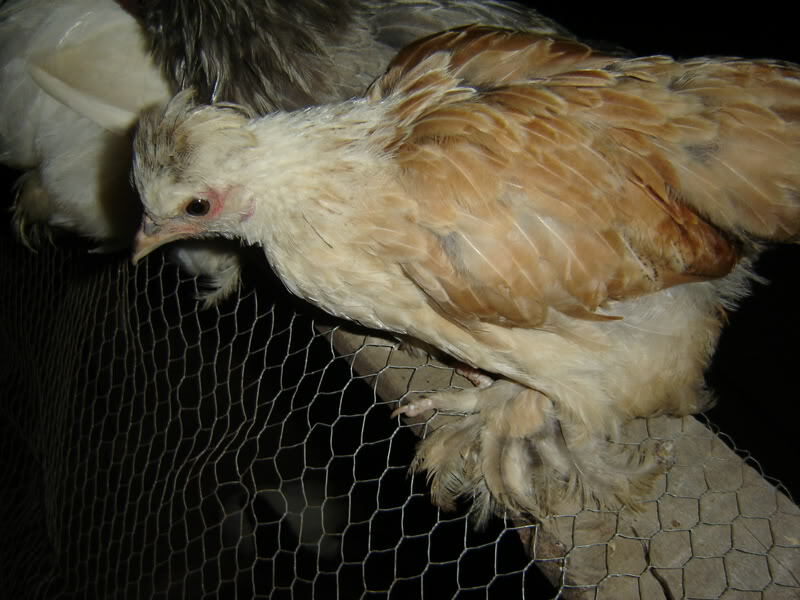 I have been trying to find out what are the things to avoid when breeding silkies. Due to living in the country, and a fair distance from other breeders, I have put many pictures on noticeboards and asked for feedback. So here are some of the pictures, with a summation of what I believe and have been told is not correct! This one's an easy one to start with! 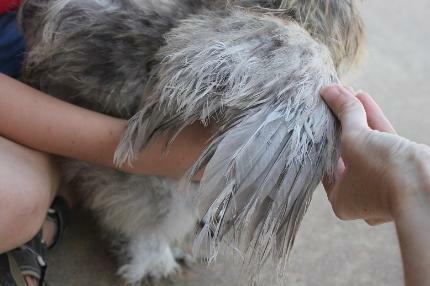 Don't let anyone try to sell you a bird with normal feathers because there are two types of silkie! This is simply not true! The silkie feathering is recessive and as such, if a silkie feathered bird is mated to a non-silkie feathered bird (such as a pekin) the resultant offspring will have normal feathers. If you were interested in showing and tried to enter this bird you would be disqualified. You can also see in this photo that the bird has a red face and pink/white feet. 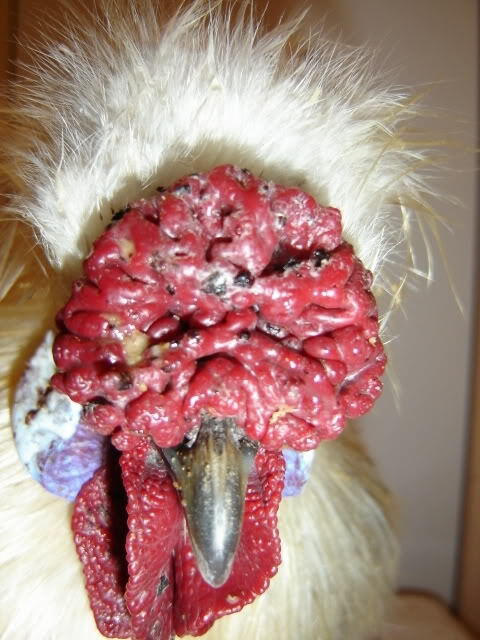 Sometimes you can get silkies with the proper feathers, but skin this colour. This is also a fault. 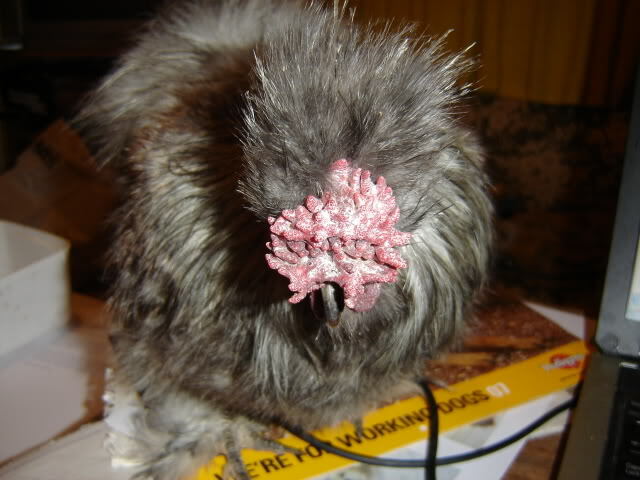 Silkie should have black skin, with black or mulberry coloured combs. Black in the comb is preferrable, but can be hard to get. Dark mulberry is good. Also the eye colour of the silkie should be black, but can go as light as dark brown. The earlobe should be turquoise. This is a rich beautiful colour. White earlobes are a fault. Sometimes, silkies will have 4 toes on each foot, 4 toes on one foot and 5 toes on the other foot, or even six or more toes on their feet. 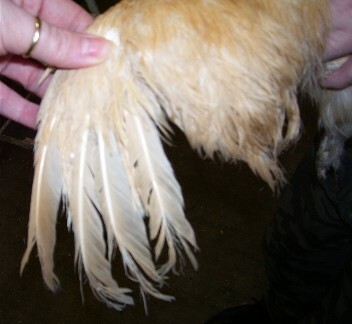 The correct number of toes for silkies is five on each foot, with the rear two being clearly separated. Sometimes the rear two toes are fused partially or fully (with just two claws on the end to indicate that they are of two toes in origin). <?<SPAN style="FONT-FAMILY: 'Comic Sans MS'; COLOR: darkslateblue; FONT-SIZE: 13.5pt">This is Gandalf, a real favourite of mine. He has gone to live with a very special person in Coolgardie. I was so disappointed that on maturity his comb is definitely asymmetrical. This is a fault. Also it is a bit too red. If it were only too red and knobbly he probably could have been bred with a quality hen, but combined with a crooked comb its a problem. However, it has been reported that he is having a wonderful life at his new home, and I am very glad I didn't have to kill him. You can see the asymmetry more readily here. 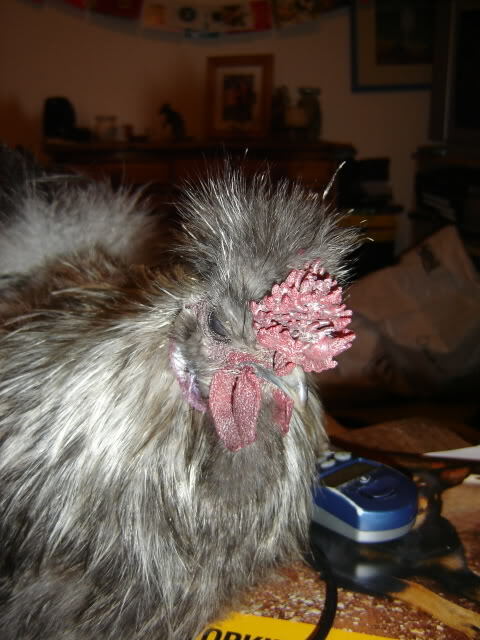 Silkies should have a walnut or rose comb. A single comb, no matter what the colour, is a fault. The rose and walnut combs are dominant to single comb. 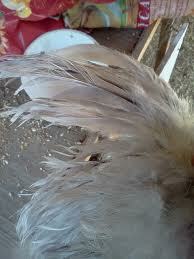 Split wings is a fault in silkies as it is in other poultry. It occurs when the axial feather is missing, and the wing droops. Scaley leg, incorrectly separated toes and incorrect number of toes are all foot faults. Also, the silkie should have feathering down their middle toe, and this can be very hard to find. See album for details.